The Military Strategic and Tactical Relay (MILSTAR) satellite system supports strategic and tactical missions through global communications that are secure, jam resistant, survivable, and have a low probability of intercept. MILSTAR's unique capabilities will enable our forces to maintain information superiority throughout all levels of conflict, enhancing full-dimensional protection and ensuring that warfighters retain freedom of action through continuous, secure communication. Space Segment: The full MILSTAR operational capability will be provided by four geosynchronous satellites. The first two satellites possess the original strategic communications Low Data Rate (LDR) payload (75-2400 bits/second), while the third and subsequent satellites will also possess a tactical Medium Data Rate (MDR) payload (to 1.544 mega-bits/second) in addition to the low rate payload. Each medium data rate satellite will use a variety of antennas to support the requirements of both tactical and strategic users. Additionally, cross-links between the satellites will provide worldwide connectivity without using vulnerable ground relays. Terminal Segment: The MILSTAR terminal segment consists of a family of multi-Service ground, shipborne, submarine, and airborne terminals functionally interoperable and tailored to meet individual Service requirements. These terminals consist of the Air Force air and ground command post terminals, the Navy Extremely High Frequency Satellite Program (NESP) ship/shore/submarine terminals, and the Army's Single-Channel Anti-jam Man-Portable (SCAMP) terminal and Secure, Mobile, Anti-jam, Reliable, Tactical Terminal (SMART-T). SMART-T is the first medium data rate capable terminal. The Navy's NESP terminals are also being upgraded to be medium data rate capable. Mission Control Segment: The MILSTAR mission control segment provides communications resource management and satellite operations support. The primary responsibility of the mission control segment is to maintain the satellite in a state of readiness to support user communication requirements during all levels of conflict. The first MILSTAR satellite was launched in 1994 onboard a Titan IV rocket. The second satellite was launched in 1996. 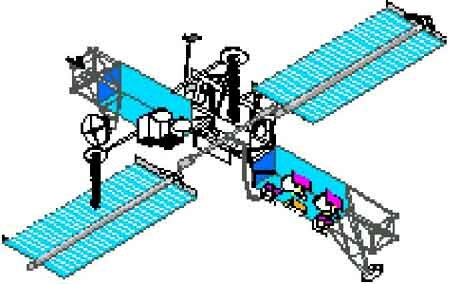 MILSTAR Flight 3, the first medium data rate satellite, was launched on April 30, 1999. However, the mission was declared a failure when a problem with the Centaur upper stage placed the satellite in an operationally useless orbit. Post-launch data indicate the Flight 3 satellite would have been able to withstand the normal launch and on-orbit environments. In lieu of an additional MILSTAR satellite to replace Flight 3, the first flight of the Advanced EHF satellite program (Pathfinder) will be launched on an accelerated schedule and programmed to operate initially as a MILSTAR II satellite. MILSTAR Flight 4 is currently projected for launch in 2QFY01. Air Force Space Command declared MILSTAR's IOC-1 on July 21, 1997. The MILSTAR low data rate system currently supports IOC-1 missions. Low data rate IOT&E was conducted in two phases. Phase I IOT&E (completed September 1995) addressed system connectivity and interoperability, while Phase II (completed March 1997) addressed system control, cross-link communications, and incomplete test events from Phase I testing. AFOTEC concluded this phase with the second Dedicated Asset Test, addressing communications connectivity over networks using cross-links between Flight 1 and Flight 2 MILSTAR satellites, as well as issues not resolved in Phase I low data rate IOT&E. The Navy completed operational field tests of their terminals' vulnerability to downlink jamming in 1996. AFOTEC based their evaluation of uplink anti-jam performance of the Air Force and Navy terminals on the results of the Air Force Information Warfare Center's jamming vulnerability model. The Army completed developmental factory tests of their terminals' vulnerability to downlink jamming in 1998. AFOTEC plans to evaluate the jamming vulnerability of the Army terminals during the planned medium data rate IOT&E in 2QFY01 (after the launch of MILSTAR Flight 4). The Milstar IOT&E Final Report (August 1988) stated that the Milstar LDR system was effective and suitable with limitations. DOT&E and AFSPC directed AFOTEC to re-test six Measures Of Performance (MOP). AFOTEC re-tested three connectivity MOPs during the September 1999-February 2000 period. The three MOPs, all of which achieved a "Met Requirements" rating were: (1) Ultra High Frequency operations; (2) Teletype message quality; and (3) Joint Chiefs of Staff (JCS) Teletype Emergency Action Message (EAM). The updated MILSTAR II (medium data rate) TEMP is currently undergoing formal Service coordination prior to DOT&E approval. The MDR tests will focus on individual and combined Service terminal tests communicating through an in-orbit satellite. Several developmental and operational test events addressing the performance of the MILSTAR II System have been delayed by the launch failure of the Flight 3 satellite. Operational testing with the Flight 4 medium data rate satellite is being planned in expectation of a 2QFY01 launch. MILSTAR low data rate IOT&E addressed four COIs: (1) system connectivity; (2) control; (3) survivability; and (4) suitability. DOT&E found performance limitations associated with each COI described below. Since these limitations have the potential to seriously degrade the warfighting capability of the MILSTAR low data rate system, each must be addressed by the development and user communities as expeditiously as possible. It is worth noting that none of the limitations are related to satellite performance. Connectivity addresses the ability of the MILSTAR system to provide secure, worldwide, interoperable communications at all levels of conflict. One key parameter relating to strategic bomber in-flight command and response is unresolved pending operational test of an Air Force terminal software upgrade. The threshold parameters for Voice Quality, Teletype Quality, and JCS Emergency Action Message receipt fell slightly below performance requirements. However, the observed shortfalls have not been shown to significantly limit mission capability. Additionally, voice conferencing to support Joint Staff MILSTAR networks was found to be ineffective. Some improvements to the voice conferencing networks have been made and will undergo further Joint Staff and AFOTEC testing. Control addresses the ability of MILSTAR to provide adequate satellite constellation planning and management and control to maintain/re-allocate user communications through all levels of conflict. There are four System Control Elements. The Mission Control Element and Mission Support Element were tested and evaluated during low data rate IOT&E. The Mission Planning Element and Mission Development Element were still in development and not tested. Tests showed a lack of established operating procedures to initiate MILSTAR autonomous wartime operating mode. Additionally, mobile constellation control stations lacked the requisite problem resolution capabilities to support the constellation during some satellite emergency conditions. Further, the endurance test revealed an endurance shortfall. Since the endurance test period lasted for less than the required duration, DOT&E directed a full re-test of the endurance requirement during follow-on testing. AFOTEC is engaged in discussions with Air Force Space Command and Strategic Command to determine the most appropriate Joint exercise to conduct this test. The test will evaluate the effectiveness of the corrective actions made to the other control issues found in IOT&E. Further discussions of control may be found in the classified version of the MILSTAR Annual Report. Survivability addresses MILSTAR's ability to provide the minimum essential wartime communications through all levels of conflict and the post-attack period. DOT&E has determined that system anti-jam performance for low data rate communications is satisfactory. Further discussion of survivability may be found in the classified version of the MILSTAR Annual Report. MILSTAR LDR also met the requirements for low probability of signal detection and interception. Although the submarine terminal met low-probability of intercept requirements, operational tests of the terminal under realistic conditions indicated that the terminal was more vulnerable to detection than previously found in development tests. This experience is being applied to MILSTAR medium data rate system tests, particularly in the area of terminal antenna performance. Suitability addresses MILSTAR's RAM to sustain operations in a wartime environment. Discussion of suitability may be found in the classified version of the MILSTAR Annual Report. The MILSTAR Space, Terminal, and Control Segments have all been certified Y2K compliant. The Air Force Program Executive Officer for Space certified Space Segment compliance on the Control Segment on September 30, 1998. The separate terminal programs have been certified Y2K compliant by their respective Service agencies. AFOTEC conducted a three-phase connectivity re-test from September 1999-February 2000. They observed a 99.1 percent success rate for report back requirement on four simultaneous Demand Activated Multiple Access channels and a 90.1 percent success rate for the Dual Modem Upgrade terminal log-on criteria. The system also demonstrated a 98.9 percent success rate for Teletype message quality, and exceeded threshold specifications for delivery of intelligible and usable EAMs. At the same time, AFOTEC observed several areas for improved operations, particularly with respect to training and procedures, which are described in the test report. The MILSTAR Space Segment continues to perform well as currently fielded with LDR capability. As there has been no operational testing with an on-orbit medium data rate satellite, no firm conclusions can be made regarding medium data rate performance. However, review of the developmental test program for the space segment has not revealed any areas of operational concern. The MILSTAR Terminal Segment has met with mixed results. The Navy's low data rate terminals have been fielded for four years with much success. The Air Force airborne and Army ground terminals have all demonstrated reliability and maintainability shortfalls. Further discussion of the Navy NESP and Army SCAMP and SMART-T terminals are provided in separate Annual Reports. The Mission Control Segment for low data rate operations has been performing its peacetime mission successfully since the launch of the first MILSTAR satellite in 1994. The transportable control terminals have demonstrated the ability to control the constellation, although there are some issues in the areas of reliability and maintainability, which are discussed in the classified Annual Report. Medium data rate operations have not been operationally tested. However, delays in the development of the automated communications management system to support tactical operations are of concern. Further discussion of this issue can be found in the SMART-T Annual Report. The Space, Terminal, and Mission Control Segments of the MILSTAR system are not maturing at the same rate. The Navy low data rate terminals have been fielded for four years, while operational tests have shown that the Army terminals are not ready for fielding. Communications planning and management systems required to effectively plan, control, and re-configure networks during wartime remain behind schedule. These disparities create numerous challenges in evaluating the operational effectiveness and suitability of various MILSTAR segments, and in evaluating the MILSTAR system as a whole. While operational testing has shown that MILSTAR supports effective low data rate communications in a peacetime environment, several deficiencies were found that affect its strategic wartime capability. Of additional concern until the launch of Pathfinder in FY05-worldwide coverage from 65 North to 65 South will not be available for the MILSTAR medium data rate terminals. The lack of a fourth medium data rate satellite will limit the ability to provide two-satellite coverage to contingency operations and therefore limit the throughput of protected communications. The Air Force, Army, and Navy operational test agencies are finalizing their individual and joint Service test plans for low and medium data rate operations. DOT&E has reviewed the preliminary test documentation, concurs with the overall strategies and emerging details, and is encouraged by the degree of cooperation among the agencies. However, resources must be scheduled and plans finalized immediately to carry out the tests as planned. To this end, DOT&E recommends that the Milestone III TEMP and ORD be finalized and approved as soon as possible.